A new combined therapy to fight the most aggressive and resistant prostate cancers. This is one of the conclusions reached by Prostate Cancer researchers from the Bellvitge Biomedical Research Institute (IDIBELL), led by Dr. Álvaro Aytés. The team, which has just published its latest results in Nature Communications, also includes researchers from the Catalan Institute of Oncology, Columbia University in New York and the University of Bern in Switzerland. The study identifies a new vulnerability in aggressive, metastatic prostate cancers that have become resistant to the hormonal therapies available today. Specifically, researchers showed that these tumors generate increasing levels of the NSD2 protein during tumor progression and acquisition of resistance to therapies. In addition, they were able to experimentally confirm that these tumors, in order to keep growing and spreading, are dependent on this protein. For these reasons, NSD2 represents an emerging therapeutic target against prostate cancer. To achieve these results, researchers used a series of transgenic mice carrying mutations that are prevalent in prostate cancer patients. These mutations were only active in the cells of the prostatic epithelium of mice, as it happens in the vast majority of patients. Based on these models, once the mice developed cancer, cells from both primary prostate tumors and metastases were isolated, and patterns of gene expression analyzed. Thanks to the the use of bioinformatics tools, researchers identified candidate genes to be regarded as vulnerabilities in these aggressive tumors. Following this experimental approach, the team identified those factors that, in a differential way, are present in malignancy and metastasis. NSD2 is one of the main examples. NSD2 is a protein with enzymatic activity that induces chemical modifications (specifically, methyl groups) to other proteins in charge of providing structural support to DNA strands, called histones. This process of chemical modification of DNA, or epigenetics, is often associated with the control of gene expression. Specifically, the modifications in histones caused by NSD2 result in a relaxation in the levels of compaction of the DNA strands (known as chromatin), triggering the expression of a set of genes with tumorigenic potential. 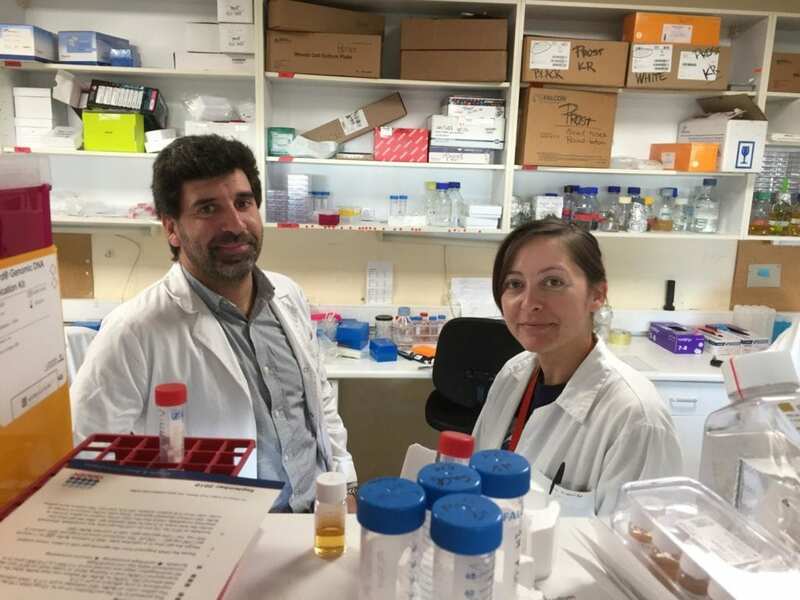 One of the main hypotheses of the researchers behind this study is that the activation of these genes – caused by NSD2 – is responsible for the development of resistance to the chemotherapeutic treatments usually administered to prostate cancer patients. In this sense, researchers are working with molecules capable of inhibiting the function of NSD2 and, therefore, decrease the malignancy of prostate tumors in mice. In fact, the study has shown that the pharmacological inhibition of NSD2 results in an increase in the survival of the experimental model, a decrease in metastasis and a reduction in the size of the tumors. Thanks to these results, researchers conclude that the inhibition of NSD2 could lead to re-sensitization of prostate tumors that show resistance to the usual antiandrogenic treatments. This may eventually lead to the implementation of a combined therapy that would include the administration of an NSD2 inhibitor drug together with conventional antiandrogenic drugs.